We made these at Bundaberg. The factory next door to the marina is a seafood exporter and has a factory shop. All too handy! 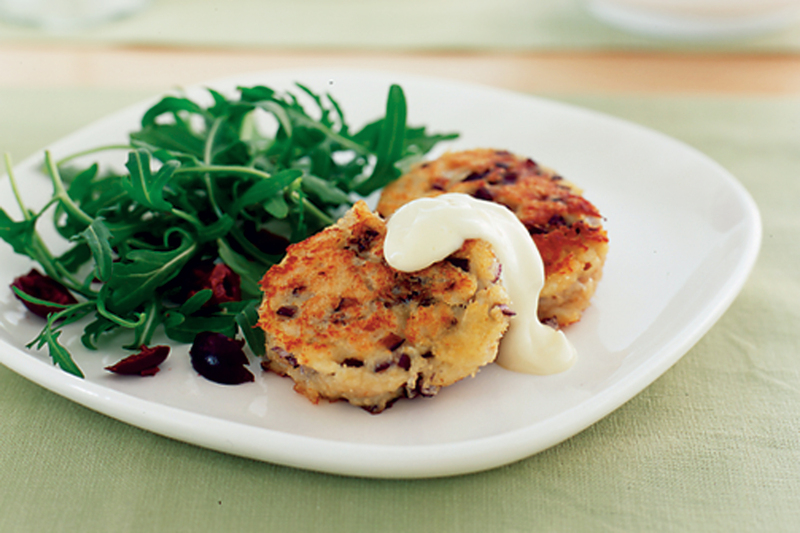 The nice thing about these crab cakes is that there is little to interfere with the flavour of the seafood. Old Bay seasoning mix is an American spice blend, sometimes referred to as Crab Boil. Combine the Mayonnaise, Old Bay seasoning, parsley , Mustard and Water and mix until smooth. Add this mixture to the crabmeat, being careful not to break up the lumps of crabmeat. Add the crushed saltines and form into patties. Pan fry in a non stick pan until golden brown. Serve with a rocket salad and a flavoured mayo. e.g. lemon, garlic, chili ….or a homemade tartare..the possibilities are endless! Traditionally, chao tom is made by pounding the ingredients with a mortar and pestle, but a food processor cuts down the work precipitously. The pork fat acts like tiny lardons to enrich the mixture; you can cut the pork fat off a pork chop or use bacon, if you like. Canola oil is a fine substitute if you’re squeamish about the pork fat. When using palm sugar, remember to pound it to a fine texture with a mortar and pestle before measuring. 3/4 cup Nuoc Cham dipping sauce. 1. Peel and devien the prawns and coarsely chop, then put them in a bowl. Add a generous 1/4 teaspoon of salt, the cornflour, sugar, pepper, fish sauce, egg, garlic, and shallot. Transfer to a food processor and process just until a coarse paste forms. Transfer to a bowl, stir in the pork fat, cover with plastic wrap, and set aside for 15 to 30 minutes. The mixture will stiffen as it sits.In the tropics, put it in the fridge or on ice. 4. Line a steamer tray with baking paper and oil the paper. Heat a pot of water for steaming. Put the lettuce and herbs on a platter. Put the dipping sauce in a small serving bowl. 5. Have a bowl of water near where you’re working, along with the prawn paste and sugarcane sticks. Wet one hand, then use the other hand to put 2 tablespoons of paste in the palm of your hand, spreading it out into circle about 2 1/2 inches wide and a good 1/4 inch thick. Center a sugarcane stick atop the paste (the ends of the stick will not be covered), then close your hand to make the paste adhere to the stick and surround it. Hold on to the sugarcane stick with your dry hand and turn the stick, all the while patting the paste with the wet hand to smooth out the surface. Set on the prepared steamer tray. Repeat to make 11 more. Put any extra sticks on a plate. 6. Steam the prawn sticks over boiling water for 3 to 4 minutes, until opaque, slightly puffed, and just cooked through. Transfer to a plate and set aside to cool. The prawn sticks can be covered and refrigerated until you are ready to cook them. Return them to room temperature for cooking on the BBQ or grilling pan. 7. Preheat a BBQ/grill to medium-high. Meanwhile, spray some oil over each of the prawn portion of each stick; this prevents sticking. Grill the prawn sticks for 6 to 8 minutes, turning frequently, until the paste is sizzling and there’s some nice browning. Transfer to a serving plate and present with the lettuce, herbs, and dipping sauce. To eat, cut the prawn meat off the stick . Wrap each in a small piece of lettuce with herbs and dip in the sauce. Chew on the sugarcane stick for some sweet juice. You can set out rice paper and a bowl for soaking the rice paper. Have people construct rice paper rolls. Small corn-tortilla size rice paper work well for the little pieces of prawn meat; or, break a larger, 8-inch-wide rice paper in half. You can also just put more of the prawn into the rice paper for a big roll. Or, you can add some round rice noodles, bun, to the garnishes and wrap it up with the prawns and herbs. We tried this Japanese snack food at the Townsville night markets. it’s a savoury pancake, traditionally stuffed with octopus. We had prawns in ours. The trick is cooking the pancake in half rounded tins, so that the pancake becomes a sealed ball. It takes a fair bit of skill to turn the pancakes in the tin with just two skewers. Here’s a link to how to cook Takoyaki, we love the cooking dog! Swordfish steaks, one per person. Spanish Mackeral steaks would also be good. Olive oil for the grill or pan. 1 cup of pitted black or green olives: (we used black for drama but green are just as nice). A small handfull of basil leaves. One finely diced bird’s eye chilli. Ten capers, rinsed if if you carry them dry. Blend all of the above in a food processor, then drizzle in no more than three tablespoons of good olive oil. Use as a condiment on the grilled swordfish, which only needs a quick time on each side on the BBQ. Thai Watermelon Salad just before adding the dressing. This just has to be about the yummiest thing we have encountered the whole way up the coast! We had it at the Spirit House Restaurant in Yandina. We were recommended to go there ten years previously by RBYC cruising friends, Travis and Gabrielle Anderson ( SV Providence), but we were further north by then and so couldn’t visit. We held the thought and intention and eventually made our way there this year! Ten years is a good time to remember a restaurant recomendation by! We bumped into Gabrielle and Travis and their two lovely children just last week again in the Whitsundays, almost ten years later to the day! The Spirit House is an amazing Thai restaurant set out at Yandina, a short drive from Mooloolaba or any town on the Sunshine Coast.The Sunshine coast hinterland is an amazing food bowl for asian food, with fresh herbs, ginger and abundant seafood all sourced locally. It is the most atmospheric venue we have ever enjoyed a meal at. Look back through the posts to find pics. We had this salad and it almost stole the show from the other four dishes! We’ve been making it ever since! 170 ml spicy chilli dressing. I sometimes add crispy fried shallots and fresh coriander leaves as a garnish. This sits very nicely alongside fresh BBQ seafood, grilled chicken skewers and makes a lovely refreshing salad. Around 10 or 11 years ago we bumped into Neil and Ley from the lovely yacht Crystal Blues. We were at Queenscliffe Cruising Yacht Club on Port Phillip Bay and they were readying themselves and Crystal Blues for extensive world cruising. I remember being impressed with Ley’s calm, organised approach to living aboard long term. This recipie for traditional english muffins is a great example of Ley’s practicality, and the muffins require a minimum of kneading to achieve a great result and are cooked on low heat on the stovetop to minimise heat in the cabin. It is drawn from the Crystal Blues website, a vast site which not only details their adventures but offers masses of high quality information to cruising folk. http://svcrystalblues.blogspot.com. Ten years after meeting Neil and Ley we are still reading and learning from this site and it’s great to see the adventures Neil and Ley continue to have! Use as fresh breadrolls or split and toast for breakfast. Dissolve the yeast, honey and olive oil in ½ cup of the tepid water and allow to bubble. Put the flour and salt in a large bowl: add the yeast mix and the remaining water. Knead by hand until the dough is soft, adding any nuts or fillings towards the end of the kneading process. The dough will be very sticky. Line or grease a loaf pan, fill with the dough, cover and allow to rise in a warm place until the dough has doubled in size. Bake in an oven preheated to 400 C for 30 minutes. This delicious bread comes from ‘Cruising Cuisine’ by the American chef Kay Pastorius. The book lives on Highland Fling and is constantly consulted for its Italian/ Mexican/ Seafood idea’s, but is also a great book to have on hand for such staples as bread and basic biscuits. Tip: mix all your ingredients in a large bowl or even in a plastic shopping bag. This makes for less clean up time and easier moveability of the dough in order to find that warm spot on the boat, as the warm spot tends to move as you tack! Use a plastic shower cap to cover the top of the bowl, saves on plastic wrap. We bought the best prawns we have encountered the whole way up the coast this week, at Gladstone. We had Avocado’s left from the Shalom Market in Bundaberg and put them together with a very HOT chilli sauce from Sriracha in Thailand. To put an accent on the flavour we added some smoked paprika and lime juice to the mayo. 1-3 teaspoons Sriracha sauce (we use Linghams) but just use a hot chilli sauce, not a sweet chilli sauce. A pinch of smoked paprika. Mix the chilli sauce, lime juice, sugar, smoked paprika and mayo together, set aside. Wash and arrange the rocket on plates. Place the Avocado slices on top. Add the prawns (or chicken) then drizzle over the dressing. Add the garlic and cook for a few minutes, but don’t allow the garlic to colour. Add bacon and continue to cook on low-moderate heat. Meanwhile boil some water and cook the pasta until al dente. Drain and reserve. Save ½ cup of pasta water to loosen sauce if needed. Add the mushrooms to the sauté mix and continue cooking over moderate heat. Season and serve with crusty bread and shaved parmesan with a rocket salad. Our thanks to the Coey family of ”Malaeny Wagyu’’ for the magnificent home-made pesto, the nuts collected from the trees lining their driveway! Heat olive oil in pan and gently fry onion until translucent. Add Arborio rice and cook softly until the outside of the rice turns opaque. Make a well in the centre and add the saffron soaking liquid and lemon zest, stir through to coat the rice until it is all nicely coloured. Make another well in centre, turn up heat and add the wine, allow to bubble away then turn heat back to medium. Gradually add the stock, stirring until the rice is al dente and the risotto a soft wet mixture. Add the diced prawns, reserving a few whole ones for garnish. Stir through lemon juice, butter, parmesan and seasonings and allow to rest for a few minutes. Stir through shredded basil leaves and serve with lemon wedges and basil to garnish. Combine left over risotto with one beaten egg. Chop a soft cheese ( mozarella is best) into 1 cm dice. Then mix breadcrumbs and parmesan in another. Poke a piece of cheese into the centre of each. Coat in flour, then egg mix then roll in parmesan breadcrumb mix. Fry gently over a low heat until crispy and warmed through enough to melt the cheese inside. Serve as a starter with a rocket parmesan salad or just as finger food or a light lunch. We have been so busy cooking, eating and dining with friends lately I haven’t had time to post these simple tips I gleaned at the SSS! They all relate to the storage and preparation of fresh seafood, so I hope they help you in your own seafood adventures! On the fish side… here on Fling we have caught naught! But we’re doing our best to keep our Omega 3’s up by eating delicious fresh seafood whenever we can. Our local fish market here makes prawn or sand crab sandwiches to order, so whenever we head into the shops, that’s our lunch of choice! So here are the tips I jotted down in that class which seems so long ago.. Allow seafood to come to room temperature for ten minutes prior to cooking. This prevents curling and ensures even cooking. Do not turn the fish too quickly; allow time for the skin to cook through in order to prevent the flesh from sticking. Heat the stock in a saucepan until almost boiling, remove from heat and crumble in the saffron threads. Cover to keep warm. Heat some olive oil in a large flat based frypan or paella pan and fry whole prawns and crab over medium heat until they just change colour. Remove and set aside. Add the cuttlefish and the cooked prawns and cook another two minutes. Here’s how we cooked our mud crab at Pittwater, inspired by Pete Evan’s recipe in his book ‘Fish’.~You could also use Blue Swimmer Crabs but may need more than one to make up the weight. Sedate the crab by placing in the freezer for 30 minutes. We used a bag of ice on the boat. Finely dice one to three long red chillies and one to three cloves of garlic. Boil salted water to cook the crab. Immerse in boiling water for one minute per 100g of crab weight. E.g. our crab was 1.4 kilo’s so cooked for 14 minutes in boiling water. Remove and place in ice water to stop further cooking. Clean crab and pick meat. Reserve any juices. Drain and reserve some of the pasta water. Heat 125 ml Olive oil and gently infuse the chilli and garlic until the garlic is cooked but not coloured. Mash in 1-3 anchovies if desired. Toss the drained pasta with the oil and the crab meat. Loosen the sauce with any crab juice or pasta water if needed. Season with black pepper, lemon zest and any fresh herbs to hand, we used Coriander but that was all we had on board. Parsley would do fine. Serve with a glass of chilled Rose and a superb view! This is a favourite meal aboard Fling, usually made the day before provisioning. The general rule is: Clean out the fridge and put what you find into a savoury frittata or Spanish Omelette. A couple of essential ingredients are required; you must have some eggs, and a potato or two. We like to use some kind of onion, white, brown, Spanish or even spring onions will do. Here’s our last ingredient list, but it’s very flexible, based on what’s left in the fridge! If we are keeping it Spanish in style we might add some smoked paprika and some Chorizo if there is any on hand. Most smoked meats are useful; bacon is always a good standby. After you gather those basics it’s a matter of finding whatever else is in your fridge and adding it in. Boil the potatoes and dice into 2 cm chunks or 1 cm slices. Fry off the onions (unless you are using spring onions which can be added later) and any bacon, chorizo etc. Dice any vegetables into bite sized pieces and whisk the eggs. Add seasoning such as smoked paprika to the eggs so they mix evenly through the omelette. Pour in the eggs and scatter the vegetables and olives into the pan. Cook on medium heat until the Omelette is almost set. Scatter the top with parmesan cheese and turn the Omelette out onto a large plate then slide it back into the frypan to crisp up the top. If you have a grill on board you can just slide it under the grill to crisp the top. Serve with a green salad, which allows you to use up all the more water based vegetables like celery, cucumber and lettuce. This is a great recipe for cooking on-board. It only takes 12-14 minutes in the oven and only requires a 12 x 6 inch baking tin, which happily fits most small yacht ovens. The added bonus is hayt it contains ginger, so good for those feeling the mal de mer! Stem Ginger is available in jars from most large supermarkets and is easier to keep onboard than the fresh ginger which has a relatively short shelf life. The mix should be soft in the centre; it will continue to cook as it cools. If cooking on-board without a food processor, melt the chocolate and butter over a pan of water, cool a little then mix as per the recipe. Prior to leaving to come up to the boat again I made loads of these to stock up the home freezer. They’re fun to make in an anchorage and a delightful snack. These are some we made onboard whilst waiting out the weather in Port Macquarie. 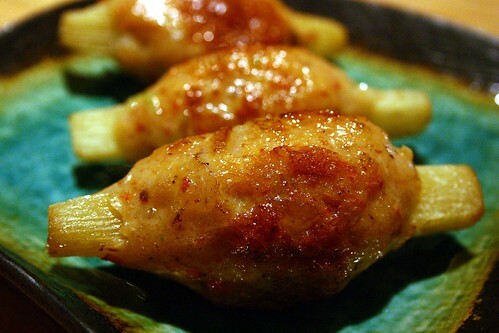 The traditional manner of cooking requires the gyoza to be first steamed, then allowed to dry fry on the pan . Out of respect for our pans and preference, we prefer to steam first, remove from the steamer, then fry with a tablespoon of vegetable oil in a non stick pan. Place the mince, cabbage, spring onion,soy sauce, sesame oil, pepper and ginger in a bowl. Mix thoroughly but with a light hand. Overworking the mince will toughen it. Place the wrappers on a clean board and put a heaped teaspoon of the mix onto one half of each wrapper. Moisten the outside edge of the wrapper with cold water. Fold the wrapper over, and expel any air from each dumpling. Starting at one end crimp or pleat the edges to create a seal. Place a steamer over a water filled wok and put the dumplings in to steam with the lid on. ( on Fling I use a collapsible stainless steel vegetable steamer which takes up very little space). The water should not come above the steamer height. Remove the steamer and empty the water. Into the dry wok or frypan place a tablespoon of vegetable oil. Place the gyoza into the pan with the pleated fold facing upwards. Fry for one minute or until the bases become crisp. Remove and plate for serving. Serve with a dipping sauce or two. The traditional dipping sauce is black vinegar but on Fling we like Siriracha chilli sauce and a soy/ sesame mix. Garnish with sliced spring onions if you have any onboard. We like a mix of chicken and green prawns mixed together. Substitute some garlic chives or spring onions for the cabbage. Yeah, I used to like No Signboard’s white pepper crab the best, but I’ve eaten there so much that I’m sick of it now. Hence, I’m hivnag to go to other shops to find the more traditional black pepper crab.